I also realised that, to really build something special for 2012 and hopefully beyond, I needed to try and open this up beyond simply the anarchist movement. Syndicalism is a radical tactic, putting trade unions and their members first, that involved a variety of people from different political viewpoints. James Connolly, for example, founded the Irish Labour Party – Ireland’s third biggest party today – in 1912 while he was a major international force in the syndicalist movement. Re-establish the Industrial Syndicalist Education League (ISEL) in advance of the centenary of its original establishment in December 2010. Mark major dates from the 1910-14 period with public events. I sent around the proposal to a number of syndicalist groups and attended a meeting of the North London branch of the Solidarity Federation – the local section of the international anarcho-syndicalist International Workers Association (IWA). There it was suggested that I pull together a meeting to discuss taking this stuff forward. So here it is – the evening of 20 May in Holloway Resource Centre. It’s open to anyone interested in getting involved in the project. Update: The meeting has now happened and we’ve created a mailing list for the project, join us if you’re interested. I also realised that, to really build something special for 2010 and hopefully beyond, I needed to try and open this up beyond simply the anarchist movement. Syndicalism is a radical tactic, putting trade unions and their members first, that involved a variety of people from different political viewpoints. James Connolly, for example, founded the Irish Labour Party – Ireland’s third biggest party today – in 1912 while he was a major international force in the syndicalist movement. 2. Re-establish the Industrial Syndicalist Education League (ISEL) in advance of the centenary of its original establishment in December 2010. 3. Mark major dates from the 1910-14 period with public events. 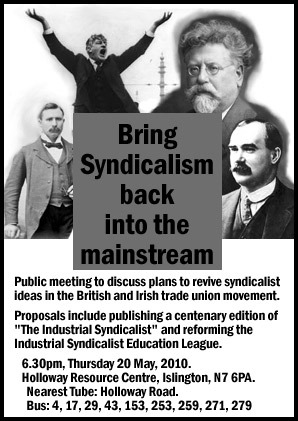 A great idea, syndicalism is definitely in need of being re-discovered by the left. The paper of the ISEL was called “The Syndicalist” not “The Industrial Syndicalist” though. Sadly I wont be able to make the meeting as I live too far from London. well I’m up for this tho away on May 20. The lack of a major syndicalist current in the labour movement has alweays been Britain’s biggest political problem of course, but remember that the curse of labourism has been more serious for political than industrial history. Look at them now, our comrades on the left, floundering around this week. Yet again, for the umpteenth time, they have allowed Labour Party to divide them from the working class, with its historic mission towin their trust, then betray tem to to finance and big business. If we can’t make some politics out of this one we never will. “The Industrial Syndicalist” was Tom Mann’s paper, which predated the creation of the ISEL. “The Syndicalist” was the second paper published from 1912-1914. How is this going so far? In my view, the only type of syndicalism worth fighting for is that prefixed by ‘anarcho’. Anything else has a tendency to be glorified trade unionism, rather than a genuine rank-and-file solidarity/direct action movement. On one level I agree with you, but the problem in recent years has been people and groups only focussing on anarcho-syndicalism and failing to engage people. Building a syndicalist movement without focussing on the ideology first and foremost is a way to engage people. Syndicalism is anarchic itself – putting the unions before parties, hostile to bureaucracy and hierarchy and willing to engage in direct action. If we get more people to give up on the Labour party or the small Trot parties and instead focus on building militancy and membership in their unions, we’ll start moving towards our goal. Look at figures like Captain Jack White or Constance Markiewicz in the Irish history of syndicalism and how they turned towards anarchism from syndicalism (explicitly in the case of White, clear from her writings in the case of Markiewicz) as they saw the failures of mainstream political action. Engage people first in action and then you can try to convince them of the politics. As for how the project is moving, it’s a bit slow to be honest. I’ll try to light a fire under it again – the London Bookfair should hopefully add some more impetus to the whole thing. Previous Previous post: Vice President of the NUJ – what I want to do.